Do you know how to properly care for your new dental crown? This new addition to your smile needs to be maintained just like the rest of your natural teeth if you want to ensure its longevity. While some treatments require special tools or rinses, dental crowns are fairly low maintenance. 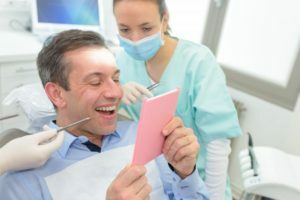 A dentist in Reston discusses what you should do while waiting for your permanent to arrive, as well as how to care for your new crown. From large fillings needing restoration to damaged and fractured teeth, there are many reasons your dentist may suggest a dental crown in Reston to fix your smile. During your initial visit, your dentist will capture an impression of the tooth or teeth so a lab can create your customized crown. To prevent further damage or infection, he will fit you with a temporary crown until the permanent one arrives. Brushing your teeth twice each day for two minutes each time. Using a fluoride toothpaste to strengthen your teeth and prevent cavities. Staying away from sticky foods and not eating 30 minutes after the crown is placed so the cement will set properly. Visit your dentist for regular checkups. During your scheduled six-month appointments, your dentist will clean your teeth and gums and check for any problems. He will also check your crown and any other restorations you might have. This will allow him to address any issues with your dental crown before it worsens. Avoid hard foods. It can be difficult not to chomp down on all that ice after you’ve finished your beverage, but because they’re made of porcelain, they can chip. Ice or hard candy can be detrimental to a dental crown and have you back in the dentist chair for a repair. Wear a mouthguard. If you are active in sports, protect your teeth and your new crown by wearing a mouthguard or face mask. Talking to your dentist about proper care and maintenance can extend the life of your dental crown. Since you’ve spent valuable time and money on restoring your smile, make sure you follow these tips to keep it healthy and strong for years to come. At Premier Dental Care Family & Cosmetic Dentistry, Dr. Farshad Bakhtyari and his team are dedicated to restoring and enhancing your natural smile. Using state-of-the-art treatments and procedures, you’ll have a long-lasting smile you can be proud of. If you’re looking for a way to fix a damaged tooth and improve your smile, dental crowns are a great solution. To learn more about our restorative services, contact us at (703) 860-8860.